On 8th January 2006, residents of Qingshuihe took to the streets to protest against the plan of the local authority to expand a waste incinerator. There is also a landfill. Incinerators in China have an image problem: they are connected to worsening environment and falling house prices. This conflict case in Shenzen is one more instance. Shenzhen is a fast growing modern city near Hong Kong. Forty years ago, Shezhen was just a fishing village. 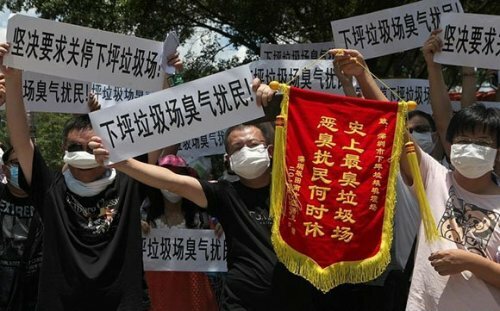 In 2006 residents of Shenzhen in Guangdong Province were stepping up their campaign against a waste incineration power station near a residential area. On 8th January 2006, residents living around Qingshuihe waste incineration power plant which was the first such facility in China took to the street to protest against the plan of the local authority to expand the plant. The protesters blockaded the road and paralyzed the traffic for more than three hours. According to the planning of Shenzhen government, an environmental "park" would be built in Qingshuihe which consisted of a number of waste treatment facilities including a new large incineration power plant, which further added to the grievances of residents living in surrounding communities. However, ten years later, the planned project has not been completed yet. Project Details Qingshuihe River area, Luohu District, a garbage incinerator was planned and a landfill collecting and burning methane (carbon credits) was built. Protests against the incinetator escalated in 2006. Ten years later, it was reported  that "the city government released a work plan to enhance the prevention of waste pollution. The plan specifies that real estate projects shall not be built near waste disposal sites... the government will evaluate the pollution status of five municipal waste disposal facilities on Qingshuihe, Honghualing, Laohukeng, Pingshan and Baigehe and will come up with technical plans to improve environmental management in these areas by the end of next year. The work plan notes that real estate projects, schools, hospitals and other densely populated buildings shall not be constructed near household waste landfills, garbage incinerators or sludge disposal plants. Environmental quality monitors will be installed near household waste landfills, garbage incinerators and sludge disposal plants." Why? Explain briefly. The incinerator was stopped because of the protests. There is a landfill in Qingshuihe which is also controversial. Residents Slam Waste Incineration Power Station , China Daily March 23, 2006.
,Shenzhen Residents Protest “Smelliest Landfill in History” By Giving it an Award. Natalie Wang. June 2, 2014.